A slightly younger industry, a desire for hands-on courses among techs, and management doing more training than their staff were among the noteworthy trends uncovered by surveys of about 340 repairers conducted by the Collision Industry Conference this year. The research presented by Education and Training Committee Co-Chairmen Gene Lopez (Seidner’s Collision Centers) and Jeff Peevy (Automotive Management Institute) might carry lessons for managers seeking to both retain employees and ensure that their technicians are trained to repair today’s vehicles correctly and efficiently (and not get you sued). Lopez and Peevy tried a version of the survey earlier this year but were concerned that respondents skewed towards management rather than the technicians they sought to reach, and the duo conducted another poll. Peevy said it was still confusing whether management was answering on behalf of their techs and difficult to get techs to complete the poll, but their survey data seemed consistent enough with FenderBender, BodyShop Business, and Automotive Body Repair News polls. In any case, the results do appear to demonstrate enough differences between what techs want and get from training and what managers do that shops should pay attention. The committee plans more polling next year. 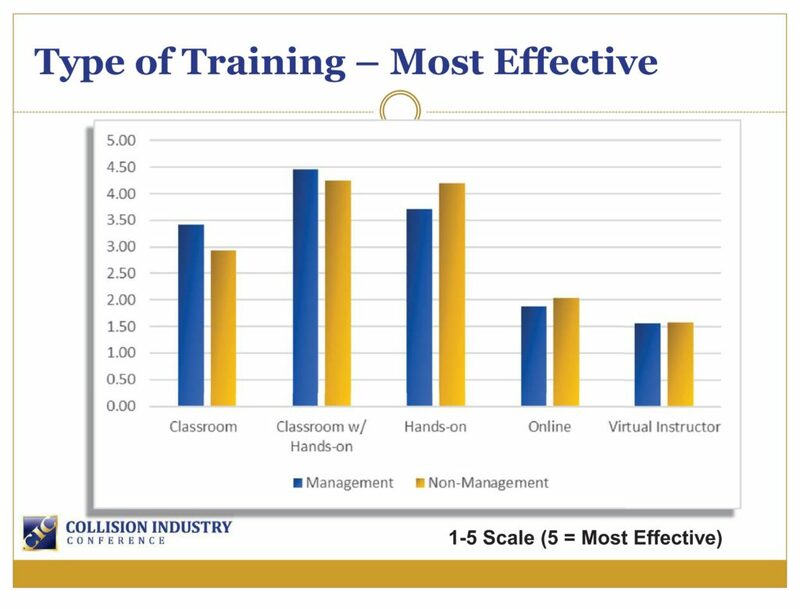 Echoing the earlier survey, data found non-management calling hands-on training most effective, while managers rated classroom-only and classroom with hands-on training the highest. Peevy said it was surprising that online training was seen this way by more non-management than management, and Lopez suggested those results might have been driven upward by the non-management estimators who responded. “They live in the Web all day long,” Lopez said. An informal poll of the audience (unfortunately, we don’t have the count of how many participated) found that 44 percent saw a virtual classroom with a live instructor growing the fastest of all training methods. That’s interesting in light of technicians and management viewing it about equally on a scale in terms of effectiveness — and both groups ranking it the least effective form of training overall. Online training was seen as the next most likely to grow by the audience — but both non-management and management saw it as the second least effective format, far below the classroom and hands-on options. An earlier CIC survey of OEMs from North America, Europe and Asia found the European OEMs preferring that auto body technicians have hands-on training, followed by classroom. Asian OEMs preferred they be taught in classrooms, then online — except on structural aluminum, which ranked hands-on ahead of online. Only North American OEMs thought online classes for technicians were ideal. 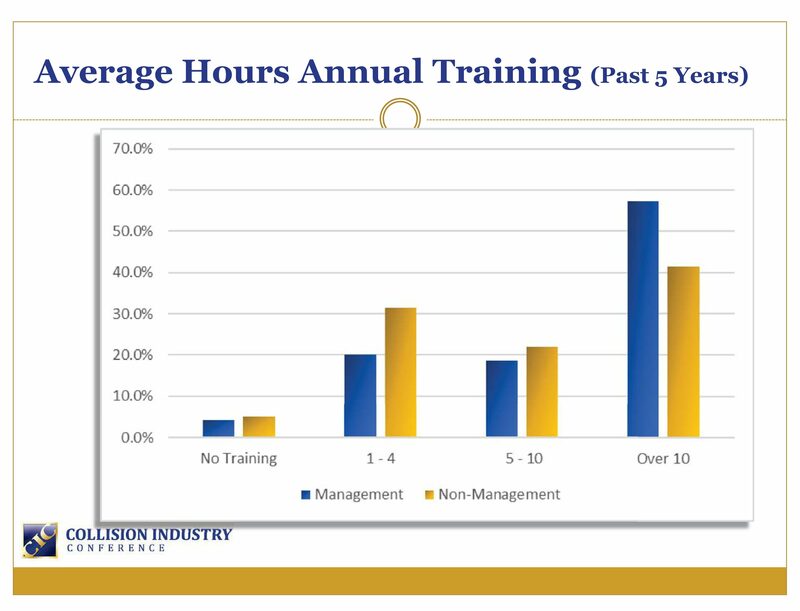 Management is far more likely to have spent more than 10 hours training over the past year, based on the survey. However, data on where the leadership is training makes it uncertain that the extra time is being spent in management-specific courses. Peevy summarized the results: “Management does a lot of the training for their shop,” he said. He said this trend had been visible for years, and it was unclear if it was a major concern or not. “Management’s taking the training, and then bringing it back to the shop,” he said. Peevy also said retention might grow if the technicians were given more training. Survey data showed that more than 50 percent of non-management received less than 10 hours of training. That’s particularly problematic in light of how much training OEMs feel technicians need to properly fix their cars. According to the OEM survey, Asian manufacturers felt technicians needed 20 hours of training annually to perform steel structural work on their respective brands, while domestic OEMs felt 27.5 hours would be necessary. European automakers, however, wanted technicians to have a whopping 76 hours of structural steel training. Nearly 97 percent of technicians felt they would benefit from more education, and Lopez said the 3.1 percent replying “no” wouldn’t feel like that if they could get the kind of exposure management might be getting at immersive programs like Audi, Mercedes or a week at I-CAR’s tech center. “That’s a huge week,” Lopez said. Among managers, only 1.5 percent felt they don’t need any more training. 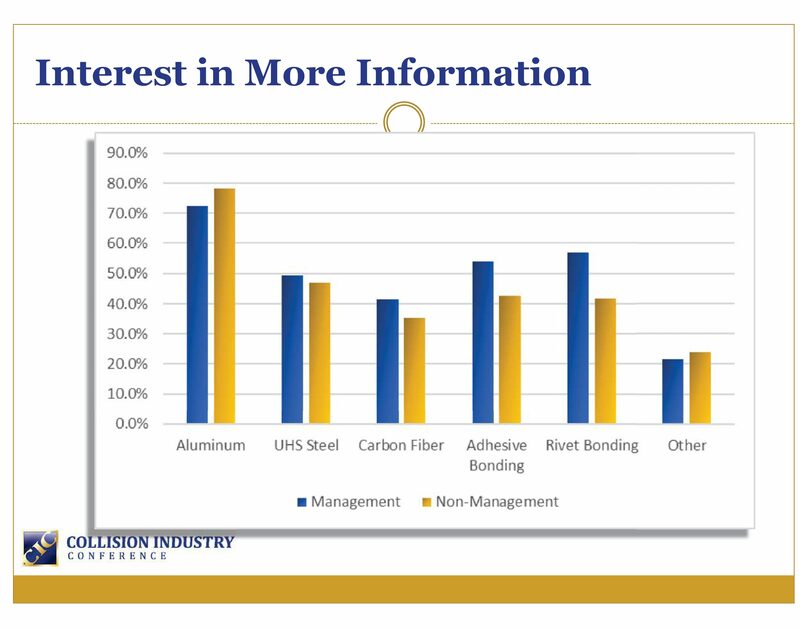 The poll found techs with a higher interest than their bosses in learning more about aluminum, but less interest in other important technical trends — notably the rivet and adhesive bonding likely needed on that aluminum at some point in the future. Lopez said that the disparity was unusual, but speculated that technicians might not be as well informed as management on these trends. 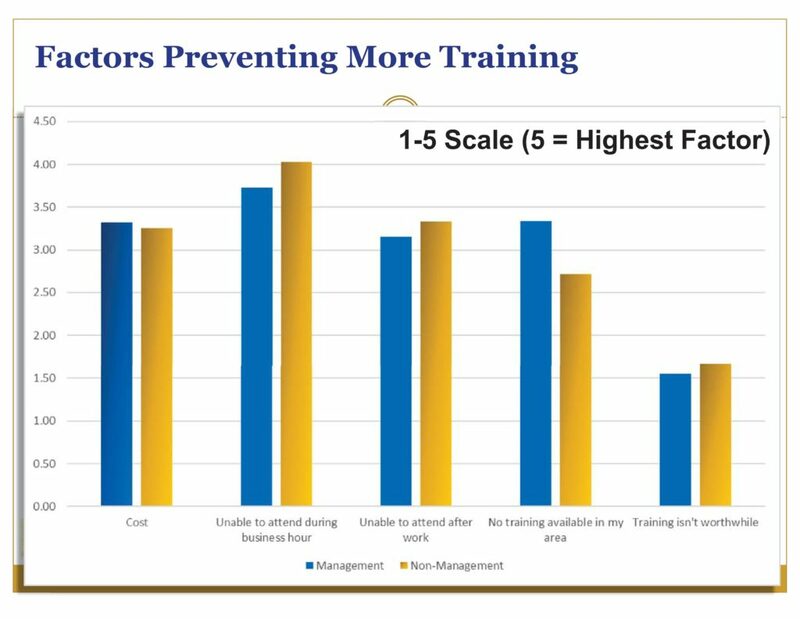 The largest barriers to training among technicians were an inability to attend during business hours or after work; non-management saw these considerations as more of a restriction than their bosses did. Non-management probably has more life commitments than management, Peevy said. For example, if you’re a 50-year-old manager, your kids are probably in their teens or out of the house. If you’re a 42-year-old tech, your kids are a decade younger and probably need more of your time. “We have to make that consideration for that age group,” Lopez said. Dorn’s Body & Paint owner Barry Dorn, said that having gone through five OEM classes, “immersed training” with a specific automaker away from concerns like one’s family and business was “very, very, very different” than taking online courses or periodic two-hour classes. Committee data shows the majority of non-management fell below 50 years old, while most of the managers were above that age. Peevy said production staff averaged about 42, while management came in at 50. Lopez said he decided to check out his own repair business, finding that the average age of his company’s 220 production staffers was 38 years old. Lopez said “I think it’s pretty cool” that the average age of staff had fallen to 42 for the industry and 38 for Seidner’s Collision Centers. “It wasn’t too long ago” that data suggested the average industry production age was 48, according to Lopez. Also interesting from an age perspective: An informal poll of 74 CIC audience respondents found 58 percent of them viewing a lack of entry-level technicians as a bigger challenge than a lack of “trained, qualified” tech. One solution could be apprenticeship programs, and Herb Lieberman of LKQ suggested during the CIC session that it might be time to consider a formal inter-industry apprenticeship system like Germany’s. Lopez said that his company and many other shops (including major MSOs) were building their own apprenticeships, and it was definitely the right move for Seidner’s. 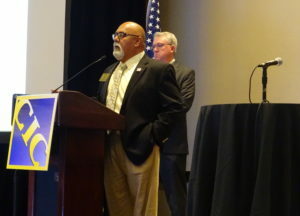 But a national apprenticeship program would be even better, according to Lopez. “That’s over the top,” he said.